I am loving all of these reader submitted recipes. Remember you can submit your recipes too! This one comes from Cindy Stetson and is sure to be a winner at my house. 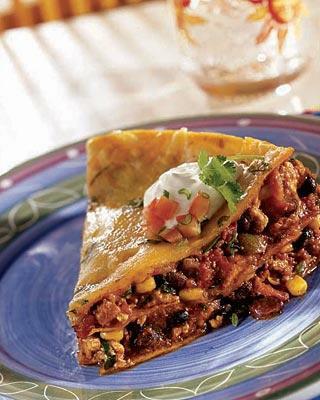 We all love Mexican food and this sounds not only filling but delicious! Brown beef, onion & garlic in skillet. Pour off excess fat and season with your salt & pepper. In a large bowl mix all ingredients (it makes it alot easier and less time consuming) Reserve a small amount of cheese to top last layer. Wipe the inside of crock pot with oil (or spray with spray pam) Place a tortilla in the bottom of the pot and spoon some of the mixture onto tortilla. ( I use a ladle, as it is less messy) Continue with layers finishing with reserved cheese on top. Cover and cook at low for 5-7 hours. Can be served with additional warmed tortillas. variations: Add chorizo sausage, canned green chili peppers or substitute stuffed green olives for black ones. Make with cooked chicken or turkey instead of beef.